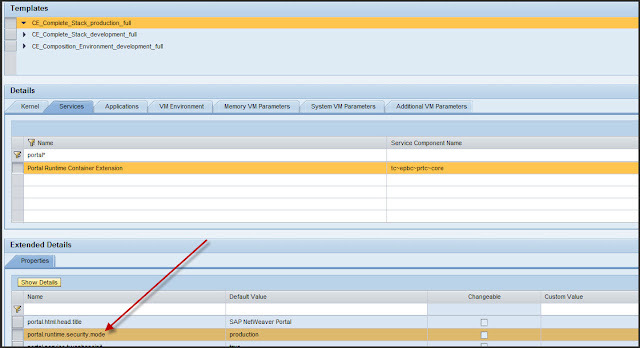 The aim of this wiki is to facilitate the changing of the SAP enterprise portal runtime mode. Depending on the usage of the portal, the server administrator makes a call regarding this parameter and introduces a added level of security. This steps for all relevant SAP netweaver releases are depicted. As mentioned in " Configuring the Portal Runtime ", the property "portal.runtime.security.mode" determines the access behaviour of the portal. For example in highly critical servers, the parameter "portal.runtime.security.mode" must be set to "production", so that this introduces a limitation that the portal components do not start directly. Other possible values as the help link mentions, are "development" or "test". In this particular wiki, the mode is being changed from "development" to "production". Navigate to <http://<server>:<port>/irj> - > system administration - > system configuration - > service configuration - > portal runtime - > central configuration and amend the parameter to "production". A complete cluster restart will be needed for the changes to take effect. For amending the parameter on 7.1, 7.2 and 7.3 servers, navigate to <http://<server>:<port>/nwa> - > configuration management - > java system properties - > select the template employed - > services - > select "portal runtime container extension" and set the parameter "portal.runtime.security.mode" to "production". Do not forget to trigger a cluster restart after this change.